It’s been an exciting collaboration,” said Court Atkins Group partner James Atkins. “Our diverse portfolio and familiarity with the lowcountry network have been catalysts in moving plans forward. Court Atkins Group, a leading Lowcountry architectural firm, has been named Architect of Record for Hilton Head's premier golf celebrity-inspired restaurant, Darren Clarke’s Tavern. The Irish Pub Company of Atlanta is steering the project. Executives there said they selected Court Atkins Group because they knew the firm would effectively guide the restaurant’s signature design and ambitious construction schedule. “It’s been an exciting collaboration,” said Court Atkins Group partner James Atkins. “Our diverse portfolio and familiarity with the lowcountry network have been catalysts in moving plans forward. The recent opening of our Hilton Head studio couldn’t have happened at a better time,” he added. The Tavern’s owner, Michael Doyle, recently relocated from Manhattan (Smith & Wollensky) to Hilton Head Island. He describes Darren Clarke’s Tavern as a "clubby" steakhouse. “Yes, there will be Irish beer, however the goal is to provide diverse menu selections including local seafood,” he shared. Doyle mentioned many of the interior design features, such as the tavern bar, are being imported from Ireland. Doyle has hired a chef and is on location at the project site daily. The restaurant is expected to open this May at the previous Truffles’ Grille location on Pope Avenue. Doyle said the project was slightly delayed due to Hurricane Matthew, however with support from Court Atkins Group “we’re navigating the town’s review board and other project challenges,” he assured. “We’ll promote the tavern during this year’s RBC Heritage Tournament since there will be a number of Clarke’s golf cronies in town," Doyle said. 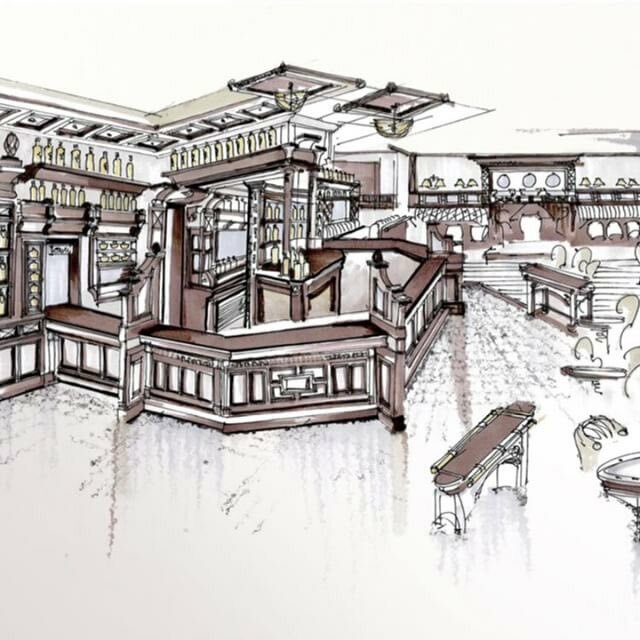 The concept for Darren Clarke’s Tavern evolved when Doyle got acquainted with the best man in Clarke’s wedding. He discovered that Clarke, like other PGA winners including Tiger Woods and Graeme McDowell, was interested in a restaurant venture. The 48-year-old Clarke is the 2011 Open champion and 2016 European Ryder Cup captain. The new restaurant’s builder is Highsmith Construction, a commercial and custom home contractor whose Hilton Head area experience dates back to 1952. The Court Atkins Group is an established firm specializing in residential and commercial architecture, planning, and interior design. The company was formed as an S-corporation in 2004 by two partners, William R. Court and James C. Atkins. In 2005, Court and Atkins moved to their current Bluffton location at 29 Plantation Park Drive, expanding the office in 2006 and again in April 2016 when they added a Hilton Head Island Studio. The Court Atkins Group works with clients to deliver personalized, responsive service that results in the highest level of client satisfaction and exceptional architectural and interior design projects. For more information please visit http://www.courtatkins.com. Rendering of Darren Clarke's Tavern. The new restaurant is preparing to welcome guests on Hilton Head Island this spring.